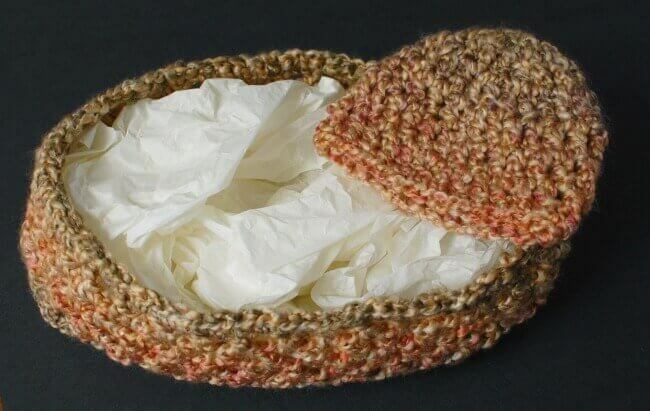 Style your newborn photos like a pro with this crochet cocoon … perfect for baby’s first photo shoot! The open stitch pattern allows for plenty of ease to accommodate baby’s body while keeping him or her safely and snugly cocooned. A simple and classic design that can be left as is or embellished however your imagination leads. Gauge: 10 sc and 10 rows = 4 in. Foundation Round: Work 1 dc in 5th ch from hook (counts as dc, ch 1, dc), ch 1, *skip next ch, 1 dc in next, ch 1, rep from * 10 (12) more times, skip next ch, [1 dc, ch 1, 1 dc, ch1, 1 dc, ch1] in last ch; **skip next ch, 1 dc in next, ch 1, rep from ** 10 (12) more times, skip next ch, 1 dc in same ch as 1st dc made, ch 1, join in space between beginning ch and 1st dc — 28 (32) dcs. Round 1: Ch 4 (counts as dc, ch 1), work 1 dc in same space as join, ch 1, *1 dc in next ch-sp, ch 1, rep from * 11 (13) more times, [1dc, ch 1, 1 dc, ch 1] in each of the next 2 ch-sps, **1 dc in next ch-sp, ch 1, rep from * 11 (13) more times, [1dc, ch 1, 1 dc, ch 1] in last ch-sp, join in space between beginning ch and 1st dc — 32 (36) dcs. Round 2: Ch 4 (counts as dc, ch 1), *work 1 dc in next ch-sp, ch 1, rep from * around, join in space between beginning ch and 1st dc — 32 (36) dcs. Rounds 3 through 8: Repeat Round 2. Round 9: Ch 1 (does not count as stitch), work 1 sc in same space as join, *1 sc in next dc, 1 sc in next ch-sp, rep from * around — 64 (72) scs. Note: I prefer starting rounds with a ch-1 followed by the first st of the round because I feel it leaves a less obvious “seam”; however, if you prefer the more traditional ch-3 start, count the ch-3 as a stitch and use it in place of the ch-1 and the first dc. Ch 4 (counts as ch and 1st dc of Foundation Round). Foundation Round: Work 7 dc in furthest ch from hook, join in top of beginning ch — 8 sts. Round 1: Ch 1 (does not count as st here and throughout; see side note), work 2 dc in same st as join and each st around, join in 1st dc — 16 sts. Round 2: Ch 1, work 2 dc in same st as join, 1 dc in next, *2 dc in next, 1 dc in next, rep from * around, join in 1st dc — 24 sts. Round 3: Ch 1, work 2 dc in same st as join, 1 dc in each of the next 7 sts, *2 dc in next, 7 dc in each of the next 7 sts, rep from * once more, join in 1st dc — 27 sts. Rounds 4 and 5: Ch 1, work 1 dc in same st as join and in each st around, join in 1st dc — 27 sts. Round 6: Ch 1, work 1 sc in same st as join and in each st around, join in 1st sc — 27 sts.